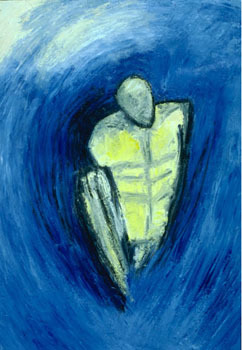 The subject of my paintings has generally been the human figure. 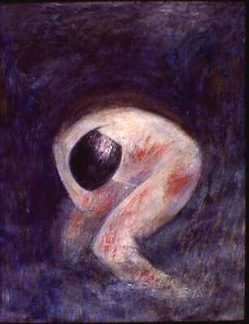 In the 1980's my treatment of the figure was more abstract.The content was invariably human emotions or feelings. 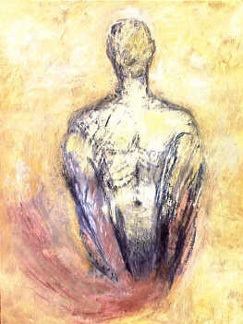 In my recent paintings both the figure's presence and feelings are more evident and there is less less movement, fewer colors and shapes, and a more spacious quality. This can be seen by comparing the recent paintings with my work of the 1970's and 1980's. Finally, many of my paintings have used the female and female/male figure(s). The recent images represent male figures, although gender is not emphasized. The underlying motivation was issues and feelings that men may experience.